It might have been the end of civilization. This is a plan for the end of the world, dated 1970. 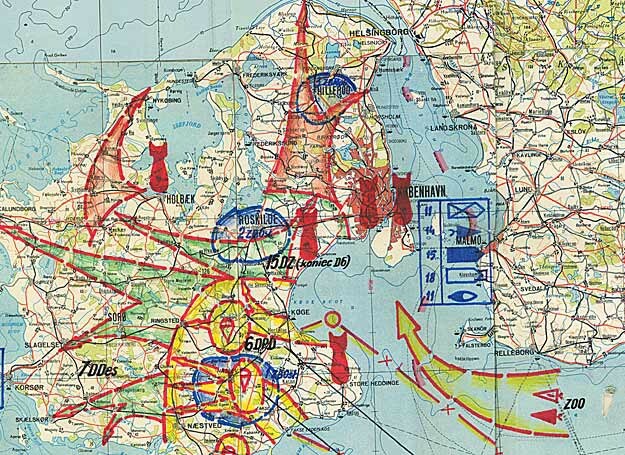 The arrows are armies and the red vertical symbols are nuclear bombs, all part of a part of Cold War contingency plan crafted by the Soviet Union and its Warsaw Pact allies in case of war. War that would have destroyed civilization. 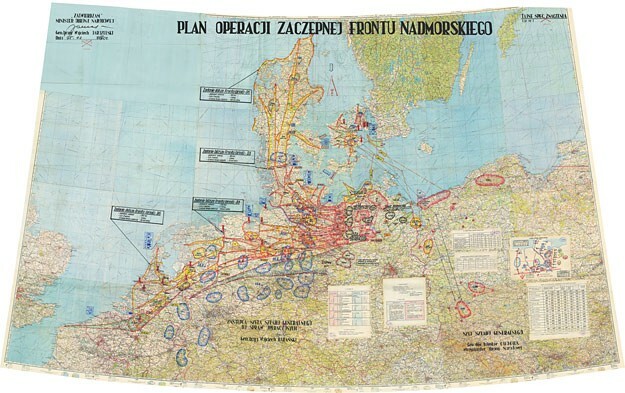 The map and other documents, discovered in Poland, show how the Warsaw Pact aimed to put tanks on the shores of the Atlantic within 14 days of the first shot being fired. Among Warsaw Pact armies, Poland’s was second in size only to the Soviet Union’s. It had a peacetime strength of 361,000 troops and could expand to 865,000 upon mobilization. It had 15 combat divisions, versus the U.S. Army’s 10 divisions today. The Poles had 2,880 tanks, 2,750 armored personnel carriers and more than 2,000 artillery pieces. In the event of war, the Polish and Soviet armies would have marched west, invading West Germany, Denmark, The Netherlands and Belgium. The attack was meant to overrun NATO’s northern ports on the Atlantic, preventing the arrival of reinforcements from the U.S. and Canada. Polish marines and airborne troops would invade Denmark on day five, knocking the tiny NATO country out of the war. All of this was to be accompanied by the use of hundreds of nuclear weapons. All the Warsaw Pact war plans released, or leaked, to the public after the Cold War feature the liberal use of nuclear weapons. According to documents unearthed in the Czech Republic, Soviet generals “fully expected Western ‘imperialists’ to make the first nuclear strike.” The Soviets and their allies determined they should stage preemptive atomic attacks if war were imminent. The Polish maps make it clear just how many nukes the Soviets would have dropped. Large-yield nuclear weapons would have wipe out economic and political targets. The West German cities of Hamburg and Hanover and the ports of Wilhemshaven and Bremerhaven all would have been nuked. In The Netherlands, The Hague, Rotterdam, Utrecht and Amsterdam were on the nuke list. Belgium would have lost the port city of Antwerp and Brussels, the site of the main NATO headquarters. Even tiny Denmark, with a population of just under five million at the time, would have been hit with no fewer than five nuclear weapons, including two dropped on the capital city of Copenhagen. The Warsaw Pact would have used many more smaller “tactical” nukes against NATO command posts, army bases, airfields, equipment depots and missile and communications sites. Radiation would have contaminated farmland and water supplies. Refugees fleeing the fighting would have been particularly hard hit. Radioactive fallout would have affected a far larger area than the bomb blasts themselves. In all, Warsaw Pact plans called for 189 nuclear weapons: 177 missiles and 12 bombs ranging in yield from five kilotons—roughly a quarter the size of the bomb dropped on Hiroshima—to 500 kilotons. And that was just for the Northern Front. There were two other fronts, Central and Southern, covering the rest of Germany down to the Adriatic. Atomic bombs factored into Soviet plans for those areas, too. According to the Hungarian Cold War archive, Vienna was to be destroyed with two 500-kiloton nuclear bombs, Munich one. Escalation to all-out, global nuclear warfare would have been practically inevitable. Some historians insist that the Soviet Union had a “fairy-tale” mindset when it came to a hypothetical war in Europe and the use of nuclear weapons. It’s also worth noting that the United States has done all the same insane planning. America’s Single Integrated Operational Plan had thousands of nukes annihilating the Soviet Union, Eastern Europe and China. It’s possible that in formulating these plans, the Soviets caught a brief glance at the realities of atomic combat—and that may have made them even more determined to avoid all-out war.